I didn’t know much about foliage perennials when I started flower gardening. I was preoccupied by color and flowers, but the longer I garden, the more interested I become in growing perennials that have attractive leaves. Foliage plants often have leaves that are an attention-getting color, such as burgundy (my favorite), silver, gold, splotched or variegated. These days, I choose many perennials – bold hostas and metallic or burgundy-leafed heucheras, for example – more for their dramatic foliage than their flowers. The point is that most perennials bloom for just a week or two and once the flowers are finished, the leaves have to carry the show. That’s when perennials with interesting foliage come to the rescue. This may be heretical for flower gardens, but too much emphasis on flowers at the expense of foliage can lead to a garden that looks disappointing overall. Strap-like leaves look good when contrasted with big bold leaves. Try combining the strap-like leaves of daylilies or Siberian irises with bold, heart-shaped leaves of perennials such as hosta or the rounded, lobed leaves of hardy geraniums. Similarly, the leaf contrast between peonies and bearded irises and their overlapping bloom times make for a lovely combination. Contrast a simple bold leaf shape with lacy compound leaves. 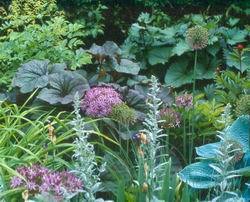 Try perennials like Hosta or Bergenia with Astilbe or ferns. Plant in groups for best effect. A generous drift of five Astilbes or ferns will have more impact next to one large specimen hosta than just one or two plants. Use other types of plants to fill out garden beds. Ornamental grasses, deciduous and evergreen shrubs, broadleaf evergreens (rhododendrons, holly, boxwood, euonymus) also provide interest in winter when perennials are dormant. For plants to grow, see Favorite Foliage Perennials.